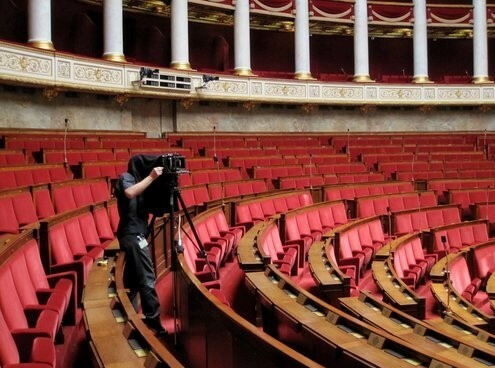 Photographer Nico Bick started photographing all European parliaments in 2010. We had a conversation on his project. Dáil Éireann in Dublin. Photos by Nico Bick. Nico, what got you to start the series? With an interest in places where there is a tension tangible between the public and private domain, I was in 2010 about to finish a long term project on the ‘Bijlmerbajes’ prison in Amsterdam. Back then it was a functioning prison and one of the most well known in the Netherlands. With the financial crises of 2008 very much on my mind, certain politicians were framing art as a so-called leftist hobby and artists as addicted to subsidies. As a consequence the cultural scene in the Netherlands was cut back by at least 30%. I felt a strong need to shake up the way we look at the places where these decisions were made and which are often seen in the news media as transparent, but are in reality very closed environments. If, as you claim, democracy is one of the most important conditions for EU membership, do we see this reflected in the design of EU member states parliaments, in other words: do they look different than parliaments in non democracies? What are differences? In architecture, furniture, ornaments, colour scheme and lighting, all parliaments radiate national characteristics in their own way. I photographed the 28 national parliaments of the European Union member states and the two of the EU in Brussels and Strasbourg. Therefore I can not really compare between democratic and non-democratic parliaments. Even if some Central European countries seem to have hesitations about democracy nowadays, I still count them as such. Besides, not all parliaments are housed in a building that was built in a democratic state. Take the Romanian parliament for example, which is housed in the ‘palace’ that Ceaușescu built. After his execution in 1989 and following the establishment of democracy, construction of the building was finished and the democratic chosen parliament, the Camera Deputaţilor, took its seat there. Parliaments are fixed places, in the sense that they are spaces which are designed, in which certain procedures are strictly outlined, and in which a certain code prescribes behaviour of those present. Did you recognise patterns? Very much so. Parliaments have either a circle, classroom, horseshoe, opposing benches or semi-circle as a lay-out. These layouts make a difference. Debating with someone seated beside you feels different from arguing with someone standing at a podium. Furthermore, countries have either a bicameral (with two chambers of parliament) or unicameral (with just one parliamentary chamber) system. In countries with a bicameral system, I photographed only the plenary chambers in which members of parliaments are seated whom are directly chosen by the electorates. European Parliament in Brussels. Photos by Nico Bick. Some parliaments are rather old, some are new, but none of them were designed with the 21st century democracy in mind: a democracy in which elected politicians have many more platforms - sometimes more effective - at their disposal to communicate with electorates. What - in your view - is the added value of parliaments in the era of internet spectacle? Many refurbished or newly build parliaments tend to look the same. Very much like airports all over the world do. As for 21st century platforms to communicate with electorates: a parliament is a legislative body of government. It has three functions: representing the electorate, making laws, and overseeing the government via hearings and inquiries. I think it is very important therefore that members of parliament talk and discuss with each other face to face. We do not want to be governed via tweets, do we? In many countries non parliamentarian democratic experiments take place; in a certain sense one might say democracy returns to the squares, or at least to the coffee houses. Did you see any changes happening to the parliamentarian settings over the course of your six year project? In researching the project I read of course about these democratic experiments – for example in David Van Reybrouck’s 2013 pamphlet ‘Against Elections’. But as of yet they do not replace a parliament and are therefore not within the scope of 'PARLIAMENTS of the European Union’ project. One has to draw a line somewhere. The project is comprehensive in the way that it involves the 28 national parliaments and the two parliaments EU in Brussels and Strasbourg. EU candidate member states and regional parliaments are not photographed. By the way, call me old fashioned – I use film for my photography, and I like to cast my vote using a red pencil on a sheet of paper in the ballot box – I do have concerns the way the political discourse is shifting to a ‘the winners takes it all’ mentality. Non parliamentarian democratic experiments are important as long the interest of minorities, a key principle of a democracy, is guaranteed. With Brexit looming, the EU will loose a member state and the Britons might get lost, there must be a certain pressure on you to have the book finished before March 29th? After the financial crisis of 2008 we had to deal with austerity, the European debt crisis, the refugee crisis and indeed Brexit. Please forgive me if I missed a few more crisis. During the years I worked on the project there was always a significant date not be missed. Two years ago, just before the Dutch elections and the French presidential elections, 'PARLIAMENTS of the European Union' were shown for the first time at the Nederlands Fotomuseum in Rotterdam, At that time sentiments were almost toxic towards anything concerning the EU. In spite of Brexit or maybe because of Brexit this has changed. I can not deny it is important for me to have the book published before Brexit becomes final on March 29th. But whatever happens, even if Brexit is postponed, it will always be a historical document and a monument on European democracy. Our annual theme for 2019 is democracy needs imagination - as much in as out of politics. Which parliament - in your view - does best reflect this take on democracy? People always ask me which parliament I like best. Or which one is the most beautiful. Or like you now, which one reflects imagination the best. I invite the viewer to look at ‘PARLIAMENTS of the European Union' as a whole, without distinction or discriminations, and enjoy both similarities and differences among the individual parliaments of the project. There are no politicians on any of your photos, did you save all of them for a next photo project? Do you expect bigger differences between them than in between parliaments? With patience and careful observation I create, together with an a analogue large format camera, conceptual series of highly detailed and monumental images. They incite the viewer to reflect on the subject and focus the attention to both the space — in the absence of its users — and the meaning of the places I photograph. The ‘PARLIAMENTS' were photographed empty deliberately. To have politicians depicted in these photographs would shift the attention to them. Nico, the photo series has been shown in museums. Will your photos also tour the parliaments themselves? 'PARLIAMENTS of the European Union' were shown for the first time at the Nederlands Fotomuseum in Rotterdam and moved to the Atelier néerlandais in Paris later that year. As much as I would love to show 'PARLIAMENTS of the European Union' at other museums and venues across Europe, it proved difficult to realise. Right now the photo works are in the depot of the Nederlands Fotomuseum in Rotterdam and anxiously waiting to go traveling again. Having 'PARLIAMENTS of the European Union' touring the parliaments themselves is not an option to me. The ‘PARLIAMENTS' need to be shown outside their natural habitat. More information on the project “PARLIAMENTS of the European Union” is available on Nico Bick’s website and on facebook.” Till the moment of publication you can pre-order the book [with a discount and free shipping] via Nico Bick’s site. The photo of Nico Bick in action in the Assemblée Nationale was taken by Ingrid Oosterheerd.